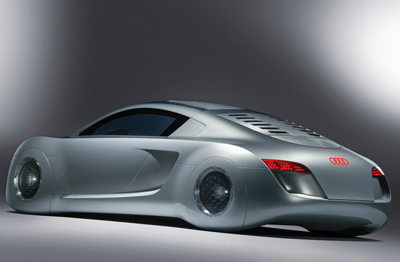 The RSQ concept starred alongside Will Smith in the blockbuster movie 'I, robot'. It was designed by Julian Honig, a senior exterior designer at Audi, and it made its world debut at the 2004 New York Auto Show. Although it was never destined for production, many of the RSQ's styling details are evident on Audi's Le Mans supercar concept - which went into production as the Audi R8. The RSQ features the novel idea of spherical wheels at all four corners to increase maneuverability. They move in a manner similar to the ball in an old-style computer mouse, theoretically allowing the RSQ to travel in all directions with equal agility. The spherical wheel concept has been proven to be viable however, and a motorcycle which uses the same idea has even been built. Imagine trying to find tires for that!